One of the prominent criticisms for Square Enix’s latest epic Kingdom Hearts III was the lack of Final Fantasy representation. The series was originally built on the idea of Disney and Final Fantasy coming together in one game. However, the final entry in the Xehanort saga didn’t have any of the latter. 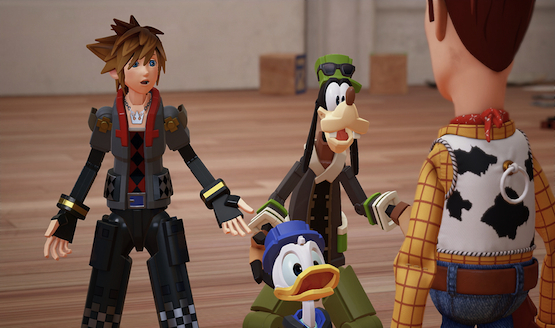 Kingdom Hearts series Co-Director Tai Yasue explained why in Kingdom Hearts 3 Final Fantasy characters didn’t appear. Yasue said, “We had a lot of original characters. It’s the conclusion of the Xehanort saga, and we really wanted to concentrate on the main storyline of Kingdom Hearts, such as Sora and Roxas, for example. They’re having all these stories in other games and we wanted them to conclude.” He was surprised to hear that the fans were disappointed about the lack of Final Fantasy representation. Juggling the sheer amount of characters from previous titles (including the Guardians of Light and Organization XIII), who already have a lot of baggage, on top of the Final Fantasy protagonists sounds like it would have been too much to handle. The team at Square Enix, however, understands the fan base’s disappointment. Yasue said, “We definitely recognize and respect what everyone’s saying.” He then clarified that he can’t make any announcements yet in regards to the upcoming DLC. The exclusion of Cloud is particularly odd, however, as Kingdom Hearts 2 left fans on a cliffhanger as Sephiroth and our Buster Sword wielding hero disappeared during their fight. The series has had less representation from Final Fantasy as Kingdom Hearts has progressed. 2010’s Kingdom Hearts: Birth By Sleep was the last title with an FF character proper, Zack Fair, and Dream Drop Distance only had The World Ends with You characters. It’s no wonder that fans have begun to worry. In addition, it’s very strange that Final Fantasy XV‘s Noctis has made appearances in Tekken 7, Minecraft, Puzzle & Dragons, Terra Battle, The Alchemist Code, and had a crossover with Assassin’s Creed, and yet never made it to Square Enix’s own, Kingdom Hearts 3, a game built on the Final Fantasy foundation. Which characters do you want to see in future Kingdom Hearts titles? Do you want to see Lightning, Noctis, Vaan, Zidane, or perhaps some representation from the MMOs of XI and XIV? Let us know!